I read with great interest Monica Das's Memoirs and More... It was absorbing. 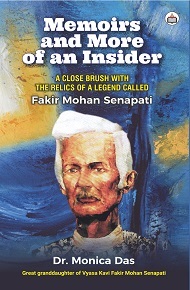 In Memoirs and More..., Monica Das has described in fascinating details her growing up in the tightly knit extended family of Odisha's literary icon and thought leader, Fakir Mohan Senapati. As a great granddaughter she never met the great man but managed to record glimpses of his personality from those who were near and dear to him. Her dedication to Fakir Mohan inspired her to establish the Fakir Mohan Foundation, a commendable initiative. Every great personality deserves a Monica in the family! Monica Das's fascinating account of a life lived in the shadow of her great grandfather, Vyasa Kavi Fakir Mohan Senapati, the father of modern Odia novel, admirably performs this task. The narrative of her discovery of Fakir Mohan's place in her life and the meaning of his legacy, chiefly centres around the house Fakir Mohan had built in Bakhrabad in Cuttack and the house in Balasore where he spent the closing years of his life. While recounting the experiences of spending her childhood days at the house in Bakhrabad, Monica Das does more than evoke a lost world of enchantment, and renders the texture of daily life lived in Cuttack years ago. Recounting details of people and events, objects and artefacts, customs and festivals, enrich this account of a world that has become memory. Social historians will find much that is valuable in the narrative. Dr. Monica Dasis the Chairperson/ Managing Trustee of Fakir Mohan Foundation, (FMF), New Delhi. She is currently a member of IAFFE (International Association for Feminist Economics), based in USA. She was an Associate Professor in Economics, Gargi College, Delhi University. Was also, a Fellow, at the Developing Countries Research Centre, DU. She was a visiting scholar at the University of British Columbia, Vancouver, Canada for sometimes. Her work on gender studies has been recognized by several International Universities. She has presented papers on gender issues and chaired sessions at various international conferences in USA, Canada, Australia and UK. Her book, Her Story So Far: Tales of the Girl Child in India was published by Penguin Books India in 2003. Her second book titled The Other Woman was published by Harper Collins in 2009. She has written several articles for prestigious magazines/ journals, on Indian art and heritage and on topics pertaining to the socio- economic scenario in India. She has to her credit, a film (docu-drama) titled Anvesan made on the life and works Fakir Mohan Senapati, which won a National award for being the best tele- film of the year. Anvesan is now with Prasar Bharati Archives. DVDs of the film are now available for sale with Doordarshan, New Delhi.